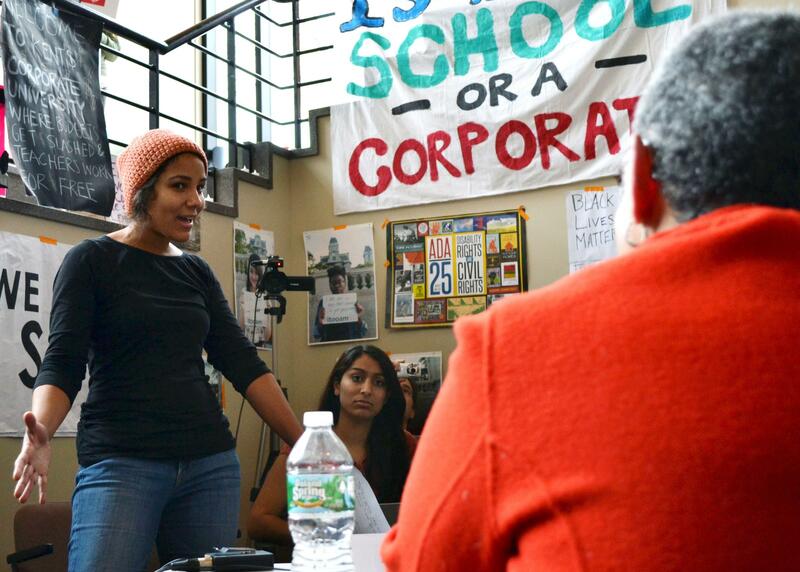 Bea Gonzalez, a dean at Syracuse University, met with student protesters Thusday before the sit-in ended. A group of Syracuse University students upset with several issues at the school surrounding student support services and administrative transparency ended an 18 day sit-in protest Thursday afternoon with several victories to claim. A few dozen students, calling themselves THE General Body, began an occupation of Crouse-Hinds Hall, the administrative building on campus, on Nov. 3. The protest was sparked by the university's closure of a sexual assault advocacy center over the summer but grew to be a laundry list of demands. Some were met by Chancellor Kent Syverud, who also formally apologized to the campus. Thursday afternoon, Dean Bea Gonzalez met with the protesters for the first time in a week, but she told them she was only a liaison and not in a position to submit to the students' remaining demands. "I can't speak for the chancellor," she told them several time. After 45 minutes of students listing their remaining grievances to Gonzalez, she left. Protesters were still calling for several more mental health counselors and another staff psychiatrist to be hired, restoration of cuts to a scholarship program for inner-city children - known as the POSSE Program, implementing recommendations from a work group to improve sexual assault services and more transparency during university budgeting. No progress was made toward any of those requests Thursday, in a meeting that was more spectacle than negotiation. Syracuse University student Yanira Rodriguez, left, speaks to Dean Bea Gonzalez Thursday. Perhaps realizing the university would not be making any more concessions, the students announced they were ending their occupation and left the building around 2:45, But they vowed to continue pressing the university for more change. "Although we are leaving this space, it does not mean this fight is over," said senior Colton Jones. "Actually it's just begun." The sit-in had begun to wear on the school. It garnered support from faculty, national media attention and racked up a hefty price tag, mostly through overtime for public safety officers. I have learned much through this process and appreciate how committed these students are to making our University better. I want the University community to know I remain fully committed to continuing these conversations and working to make Syracuse University the kind of campus where everyone feels welcome and respected. The costs and overtime hours are starting to add up for Syracuse University as a student sit-in protest nears the end of its third week. The university's public safety department has had to station multiple officers in Crouse-Hinds Hall, the school's administration building, around the clock since Nov. 3. They're keeping an eye on the dozen or so students living there as part of a protest against the administration of chancellor Kent Syverud. The student sit-in at Syracuse University’s Crouse-Hinds Hall has entered its third week. The protesters who call themselves "THE General Body" say they are attracting a groundswell of support from faculty, and held a rally to show it. "I swear to you that us faculty members will stand behind you, not for as long as you are sitting in, but forever after," said S.U. Geography Professor Don Mitchell, who offered support to student protesters at a rainy rally in front of the Hall of Languages Monday. Syracuse University's chancellor says he's issued "the final word" to a large group of student protestors and it's time to move forward, but the students have no intention of moving out the school's administrative building, which they've called home for nearly two weeks. In a letter to the campus, chancellor Kent Syverud this week gave the student protestors something they've wanted for awhile: a formal apology for the way the university closed a sexual assault advocacy center over the summer.